Social media marketing and analytics tools are like peanut butter and jelly – one just won’t work without the other one. Analytics helps you understand what you do well and, even more importantly, what do do wrong so that you know what to fix and improve. I prepared a list of 10, in my opinion best social media analytics tools in 2018. Just like Sherlock Holmes carefully gathers evidence and puts together another pieces of the puzzle to solve a case, you should gather, analyze bits of data to make sense of your marketing efforts and get the full picture of the situation – social media analytics tools are here to help. Let’s see what the best social media analytics tools are. Some of them are free, some paid. One, seemingly unrelated social media analytics tool is Google Analytics. Another, this time paid, social media analytics tool I personally really, really, really like is BuzzSumo. Content discovery: Find most shared links in social media. It’s a powerful feature for content writers! Content analysis: Find social media data about particular topic of interest: Content type, top shared domains, top platforms, etc. Influencer marketing: Find top influencers in a niche or industry based on social media reach or engagement. Correct, that’s us – one of the best social media monitoring tools. Says who? Says Buffer! Brand24 is a paid tool starting at $49 a month and offers a free, 2-week trial (no card required). 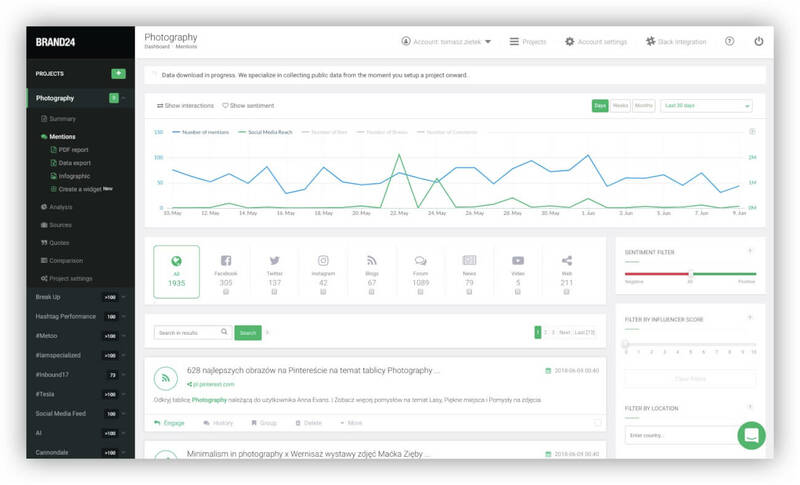 The tool does web and social media monitoring and analytics. You can monitor keywords related to your company, for example company name, website address, company hashtag, marketing campaign name or hashtag and discover how they perform in social media in terms of social media reach, engagement, volume of mentions, influential sources mentioning them, etc. Social media analytics: Analyze the performance of your keywords on Facebook, Twitter, Instagram and YouTube, including volume of mentions, social media reach, sentiment analysis of your keywords. One of the best social media analytics tools is Cyfe – a business dashboard tool. It syncs up data from many, many, many marketing tools in one place. The number of available integrations and dashboards is astonishing and makes Cyfe a powerful tool – it covers not only social media analytics tools but also advertising, email, monitoring, sales, SEO and web analytics tools!!!! However, let’s focus on the social media part. At Brand24, we use CoSchedule as our editorial calendar – it never let us down and we can surely recommend it to all small, medium and large businesses. Another all time best social media analytics tool is Sprout Social. It’s comprehensive social media management tool you can use to track your performance in social media. If you’re interested in the hashtag game, Keyhole is a nice tool to learn a bit about the hashtags you use. Keyhole supports also account, keyword and URL tracking on the Web. What’s more, you can use Keyhole to track mentions about social media profiles, keywords and URLs. Brandwatch is one of the best social media monitoring and analytics tool out there. Audiense is one of the best Twitter analytics tools. What’s cool is that it’s free if you have less than 5k followers. What are your best social media analytics tools? Do you have any favorite best social analytics tools? Let us know in our social media – on Facebook, Twitter or Instagram.